Near the beautiful village of Vrahasi there is the imposing gorge of Selinari, formed by the mountain of Anavlohos (625 m) to the north and the mountain Fonias o Detis (818 m) to the south. 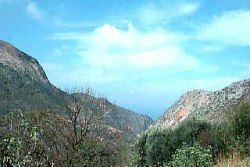 The symbol of Crete, the Cretan wild goat (Agrimi or kri-kri) and the Griffon Vulture are two rare species that used to reside in the gorge. The Municipality of Vrahasi intends to establish a center of protection of the local fauna and flora at the gorge of Selinari and to develop a wildlife station, to provide observation of the Griffon Vulture colony at the east side of the gorge of Selinari. The hunting is forbidden in an area covering 10 sq.km. around the gorge. Agrimi or Kri-Kri is a rare kind of wild goat, that survives since the Minoan ages and still lives free only in the mountains of Crete. Homer mentions that this proud and untamed animal lives at places where no man can go. The Griffon Vulture colony of Selinari roosts and breads on southeast facing cliffs immediately above the small bridge on the "old road". The colony is around 35 birds. The breeding cycle begins in January with the first chicks flying from the nests in late June. The chicks continue to be fed by the adults at the nest for at least a further six weeks after the first flight. This means that there is considerable all day activities on the nests during the months of March through to and including August. In the remaining months activity is at its highest as the birds return to roost in the afternoon which is very exciting to watch. At the side of the gorge of Selinari, at the 42 km. 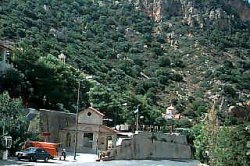 of the national road Iraklion - Agios Nikolaos is the small old chapel and the newly founded monastery of Agios Georgios Selinaris. In the monastery there is also a home for the aged founded in 1963. The small chapel was probably founded early in the 16th century AD, and ever since it is a place of worshipping. The people passing through the chapel stop to light a candle to the saint. The chapel is considered miraculous, there are various legends concerning miracles related either with healing of sick people or with divine punishment of people that did not pay the respect due to the saint.